The TT group is closing out the year with "something new" on New Year's Eve, so that's exactly where my nails went. I thought about doing a composite skittle like last year with some different designs in gold and black, but my favourite part of New Year's Eve was always the countdown, watching that big, sparkly ball of light make its way towards midnight. So this year and to celebrate "something new," I did the New Year's Eve countdown ball in sparkly, silver glequins. The base polish for these is Orly Dazzle, a shiny, fantastic foil with a formula that's super easy to work with. As much as I've been talking up Zoya Ziv lately as my go-to gold, I feel the same way about Dazzle for silver. After polish, the glequins! I think I'm getting better at them maybe? I know they're still a ton of fun to wear (oh em gee, the sparkle!). 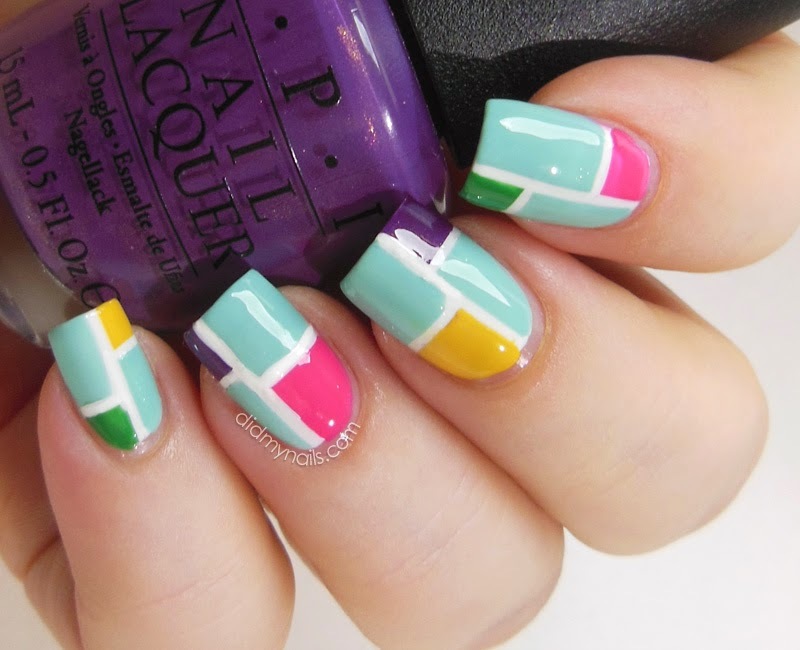 While I was doing these, the idea occurred to do a multi-coloured accent nail, like the ball in Times Square is now, but I worried that it might be a little much. And then I nodded my head because yes, I was sticking all this glitter to my nails, piece by eye-squinting piece, precisely in the name of not-too-muchery. So, I rainbowed up the ring finger, and it was thoroughly fabulous. Only, it didn't look especially "New Year's" anymore, so despite the fabulosity, I went back to silver to be more like the classic New Year's Eve countdown ball, before it went all LED and stuff. Or possibly when I just imagined it as an emormous, disco, mirror ball. Whichever way. Sparkly New Year! Happy New Year's Eve to my fellow Twinsies and to everybody who has stopped by Did My Nails in 2013! It's been an amazing year that wouldn't have been nearly as fun without y'all. Here's to a wonderful 2014! OPI Spark de Triomphe is a glitter mix of platinum and champagne gold that looks like New Year's Eve. I bought it a couple of months ago thinking to wear it for the occasion, but instead of that planned New Year's Eve glitter gradient over basic black, I went ahead and wore it today over a rich, black cherry. Sure enough, OPI Spark de Triomphe really does look like a glittering spill of champagne across the nails, and I love the way it works with the deep, berry-red bordeaux of OPI We'll Always Have Paris. I actually bought We'll Always Have Paris en route to the US this past summer when, within about 12 hours of leaving my flat (the majority of which coincided with me just sitting on a plane, trying not to succumb to a combination of epic boredom and restless leg syndrome), I had literally broken half my nails. I have no idea how or why, but they KNOW when I travel, and they DO NOT LIKE IT. Anyway, once that first leg of my trip was over I marched straight to XpresSpa in the San Francicso airport for an emergency manicure. I thought a dark, rich, vampy shade would look good on the shorties I'd be rocking when I came out of there--and I was right! So, I don't know if you can see much of a difference or not, but just knowing I was going to wear We'll Always Have Paris again, I filed my nails down a little bit to go with the darker colour. By the way, XpresSpa did a fab job, but even all nicely shortened and even and everything, I somehow managed to break three of them all over again--to the quick this time--before I got where I was going. My smexy, black cherry shorties were reduced to nubs, which I spent the entire month I was on holiday nursing back to health... effort and attention that my nails repaid by breaking again just one day before I started the long trek home. Thank you so much, fingernails! Could we maybe start a New Year's thing where you quit that noise? I'd be ever so very grateful! I had all these plans to do a series of New Year's Eve nail art ideas, but then Christmas came, and Husband and I discovered an urgent need to be lazy for a couple of days and accomplish nothing. It was glorious. I did spare just a little time, though, for some thought about what my hands might wear for New Year's Eve, and while I've decided to go with nail art after all, I also gave real consideration to butter LONDON Bit Faker. 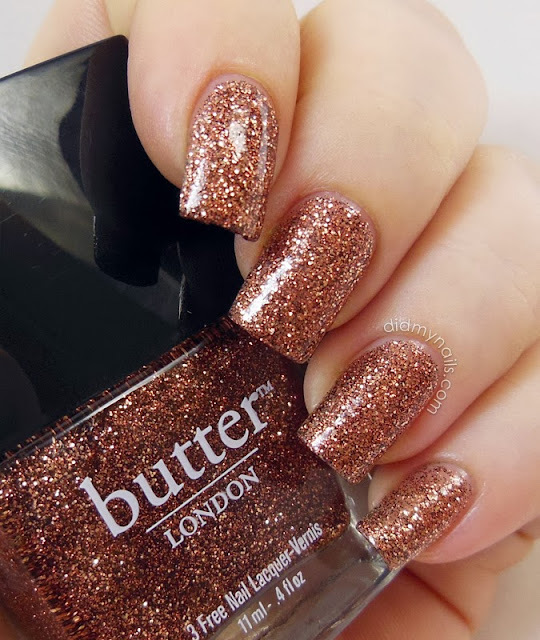 From butter LONDON's summer 2013 collection, Bit Faker is a rich, copper glitter dense enough to be worn alone. Even with a somewhat thin first coat it's sufficient for daily wear at two, but I did my customary three here for the camera. And while it's worth mentioning that it's top-coat-thirsty, it isn't any more so than other similar glitter polishes. I thought of butter LONDON Bit Faker as a fun choice for New Year's Eve because while it's all kinds of bright and rich and sparkling, the copper-brown colour isn't as overtly "New Year's" as gold or silver. And then I swung back towards the overt end of the scale instead, but I still loved wearing this awesome glitter! By the way, if you look at other swatches of butter LONDON Bit Faker online, you'll probably see a huge range of differences in colour. I've seen everywhere from "old penny" brown to a nearly golden bronze and everything in-between. Skin tone and lighting and all that stuff make a big difference when you look at Bit Faker. But given that a "bit faker" is someone who counterfeits coins, I think it's safe to say this complex copper looks like ground-up, sparkling pennies. 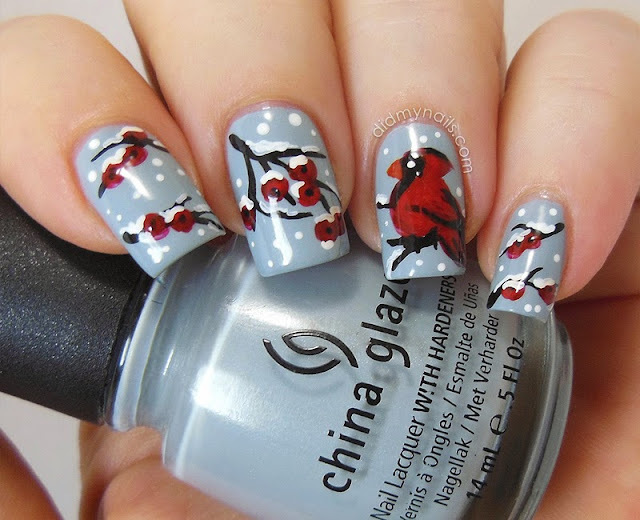 Last year while I was looking for Christmas nail art inspiration I came across this gorgeous cardinal manicure at Nailed Daily and fell totally in love. I wanted to try it immediately! I'd only just barely begun trying to paint things that looked like actual things, though, so I bookmarked it with a little wishful thinking and said, "Maybe next year..." Then I was reminded of it a couple of days ago and thought, "Ohai, next year! Let's go for it." I mean, worst case scenario, it's awful, and we pretend it never happened. But I was pleasantly surprised! Even if this isn't an overtly "Christmas" design, it absolutely is to me because of my grandmothers. Every year I hang a cardinal on my tree. He actually came as a gift, from my Gam's tree to mine, and he reminds me of all the Christmases when I was little, when the trees at my grandparents' houses were the biggest, most beautiful, most brilliantly sparkling things in the whole wide world. I didn't know then that a cardinal on your Christmas tree is meant to bring good luck for the coming year, but Gam and Grandmama both had cardinals; therefore, cardinals equaled Christmas. Happy Tuesday and Merry Wednesday Eve! This week's TT theme is our third "special something," something old, and...two years counts as old, right? At least, in nail polish and nail art and stuff? Because I came across a Christmas nail art design that Tera at Nails in Nippon posted two Christmases ago that I could not wait to try! 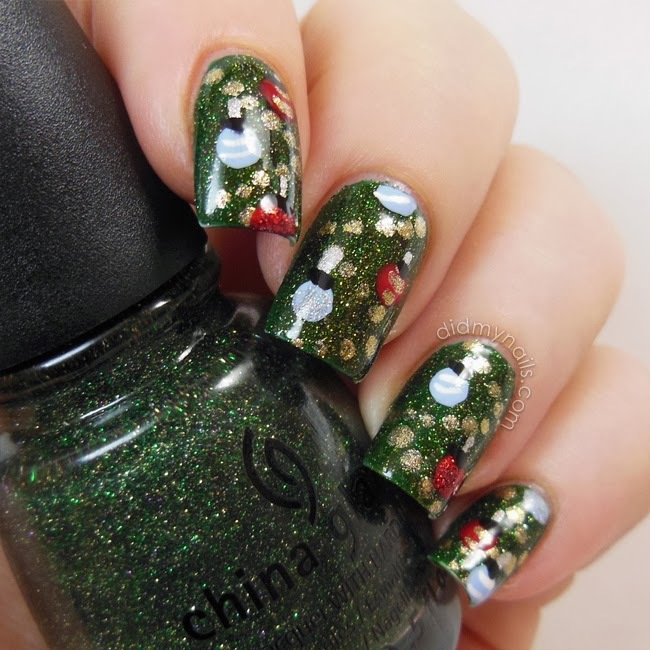 The base for these is a layering combination of Bandi City Green, SpaRitual Optical Illusion, and China Glaze Winter Holly, over which I dotted golden garlands of Zoya Ziv (alliteration FTW!). In retrospect, I kind of like the silvery garlands Tera did, especially since I decided not to add "lights" to my Christmas tree, but I do love me some Ziv. For the ornaments I lightened some Essie Bikini So Teeny with a teeny bit of Essie Something Blue, but retrospect #2, I think I'd have liked it that little bit darker. The red ornaments are OPI Big Apple Red, half of which got striped with some Ziv, and half of which got some Milani Red Sparkle glitter (the plain red one, not the red and gold one with the same name). Oh yeah, and the blues got a similar treatment, white stripes and/or silver glitter. 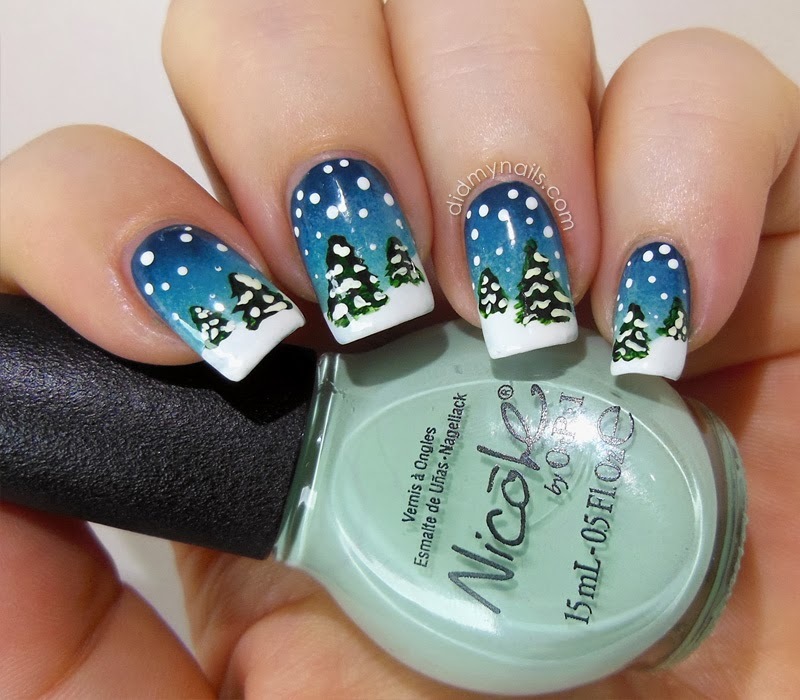 I wore these nails to see The Nutcracker this weekend and felt so Christmassy! Hong Kong seems to be getting into the holiday more and more--I just wish the weather would cooperate, but I wish I had a pony too. Back in reality, we have a big stack of Xmas movies and specials to watch tomorrow, and I'm looking forward to a fun, relaxing day at home and a tasty Christmas dinner of New Orleans red beans and rice because that's what the local groceries had the ingredients for me to make. Hur. 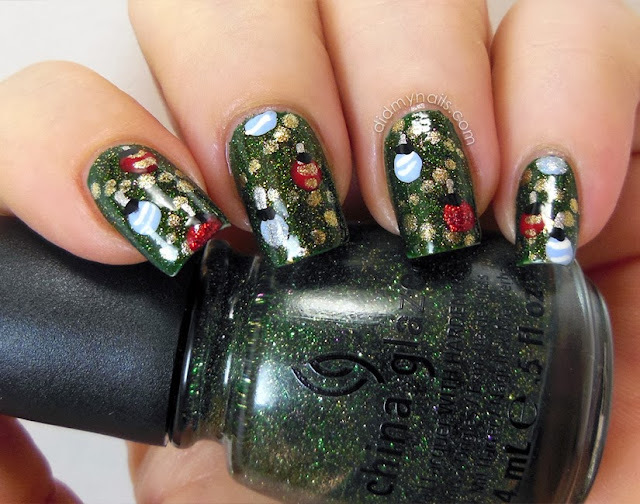 More Christmas nail art today, with some stamping practice too! Like the snowy tree gradient I did on Tuesday, this is another look that's more seasonal than holiday-specific, but then I'll take any excuse to leave the flat with my nails all blue and sparkly. To be honest I wasn't even aiming for winter when I started this manicure, but then things just kind of...(oh, no. inadvertent pun incoming)...snowballed. See, what had happened was (a phrase that, in my head, is always said in Will Smith's voice...), these nails started as a jelly sandwich, but then I couldn't resist another layer and a half of glitter, and the sparkle was amazing. And then I thought, "Ooh, it's December, nearly Christmas. How about adding some snowflakes?" But then I was like, "Hmm, that might be a little too much." Which made me all, "Wait, 'too much'? Is that even a thing?" I thought the stamped snowflakes would be a bit more subtle, though, and kinda sneak in all winter ninja-like while the eyeball is busy handling all that glitter. The blue is Nfu Oh JS14, a faded denim jelly. The glitter is OPI Servin' Up Sparkle, which I need to wear a lot more often because the holographic sparkle is insane. And then on top of all that I used one of the two snowflake images from Konad stamping plate m59, along with Konad stamping polish in white. 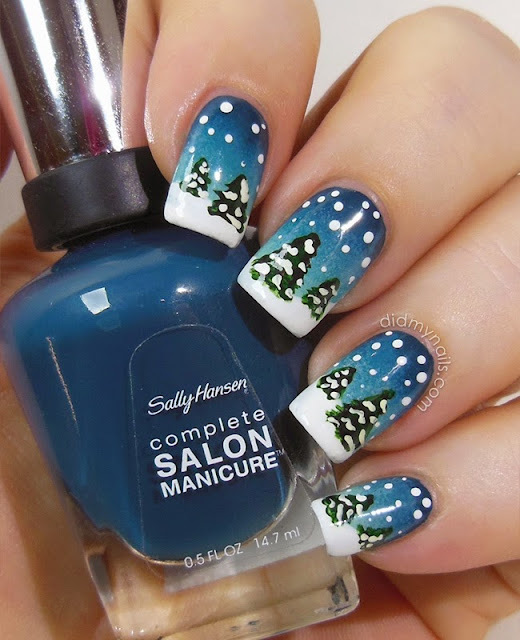 The snowflakes really don't stand out much at first glance, but I kinda really like that. The overall look is just sort of soft and sparking and little bit lacy, and then hey, it's falling snow! And I love these all the more because they just sort of happened this way. Even the stamping managed to go where I wanted it to without smudging or acting weird and stuff! All in all, a nice surprise all around. This month's trip into the wayback machine is a visit to the first ever manicure I did where instead of a dotting tool or a toothpick or sponge, I used an actual paintbrush to do nail art. The design was Christmas poinsettias, based on this Robin Moses video, and while I knew it was going to be a long time before I felt proficient with a paintbrush (correct, given how easily I'm still thwarted by super-complicated things like, say, lines and circles), I also knew I was going to have a lot of fun learning--and I still am! As before, I started with a base of white (this time, Pure Ice Superstar) with a layer of Orly Au Champagne to soften it just a little bit. But this time around I used acrylic paint instead of nail polish for the flowers and leaves. Still went with Zoya Ziv for the little gold dots in the centers, though. I always, always love Zoya Ziv. 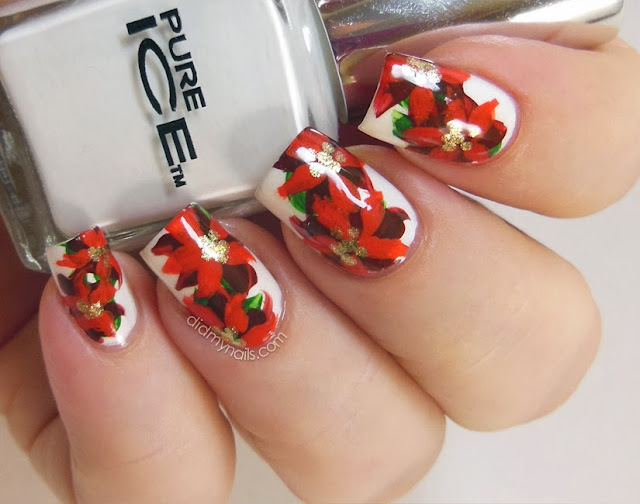 I definitely see an improvement in nail shape over last year's poinsettia nail art, but it's possible I've slipped back into "own worst critic" territory again because I was hoping to see a little more improvement in the actual flowers in a year's time, especially since acrylic paint is so much easier to work with. Husband fussed at me long and hard, though, when I said I wanted to do these over again, so I'm going to leave off further comment, say a big thank you to him for the encouragement, and post away. 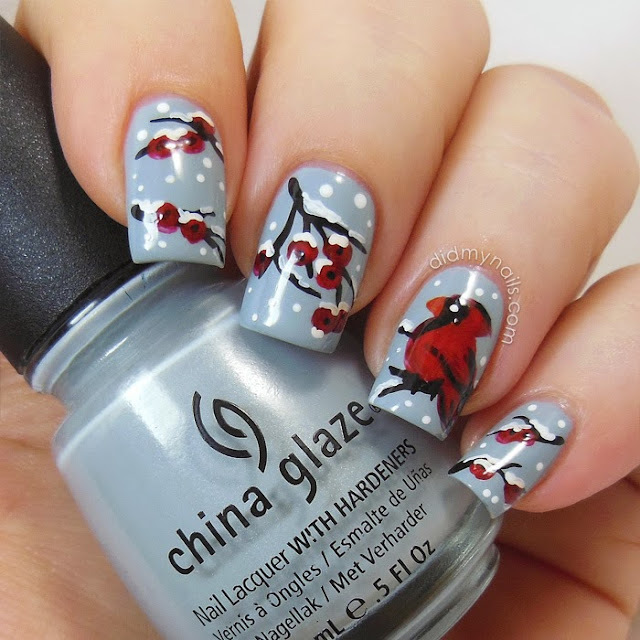 PS: Heather did an adorable version of these with China Glaze Poinsettia! I just had sparkling, silver nails a few days ago, but I could not wait any longer to try out OPI It's Frosty Outside, from the OPI Mariah Carey Holiday 2013 Collection. GUH. How gorgeous?! SO gorgeous. I have officially flipped my lid and can not even with the amount of gorgeous this entails. OPI It's Frosty Outside is yet another awesome addition to the Liquid Sand line. 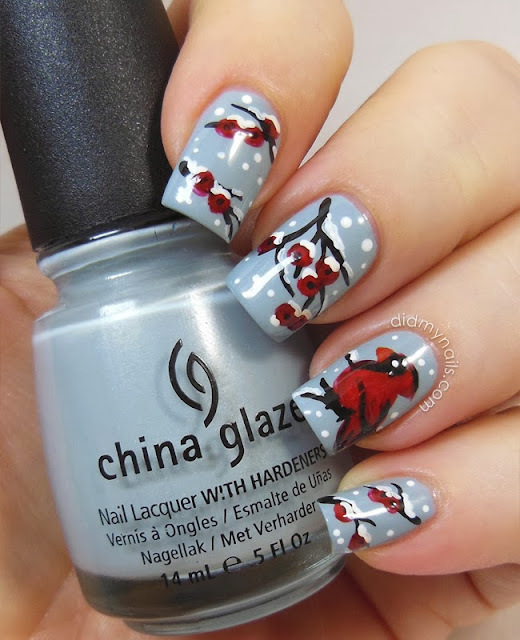 Incorporating fine, silver, nearly matte micro-glitter and little, round pieces of silvery flash, this polish somehow manages to hit a perfect balance. It's sparkly and pretty and eye-catching-ly lush, but it doesn't even flirt with the idea of being too much. Basically, it's fabulousness in a bottle. The formula is fantastic too! Perfectly easy to control, and it's richly opaque in just two coats. And can I just say how pleasantly surprised--delighted, even!--I've been with the OPI Liquid Sand and Zoya Pixie Dust lines? 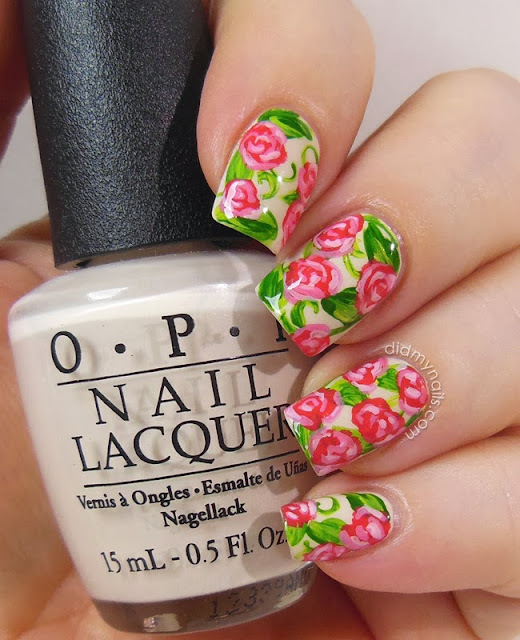 I was originally so dubious about the whole "textured" concept, but OPI has just been killing it. 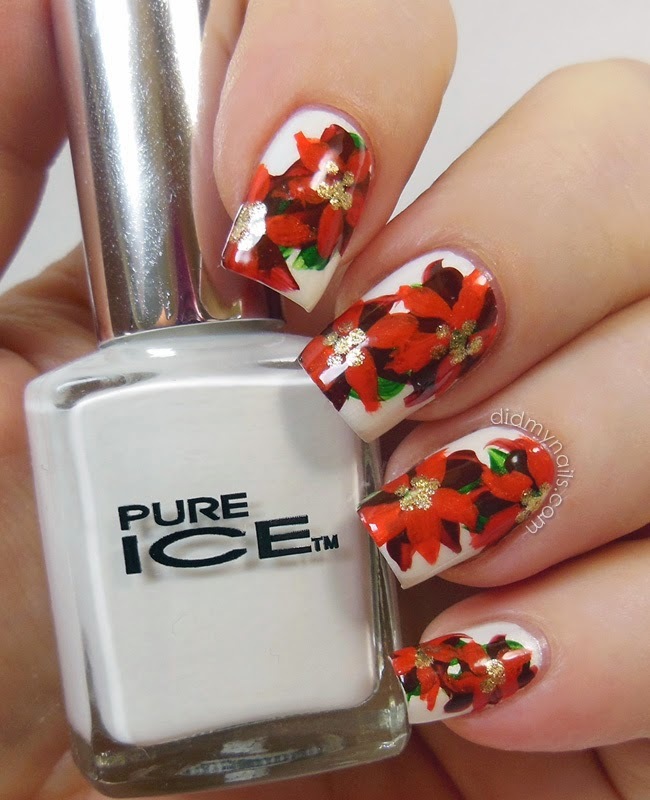 OPI It's Frosty Outside is perfect for the holidays. It's a great look for Christmas parties, New Year's Eve... Wednesday afternoon at the dentist... Pretty much always, all the time. A month or so ago I wore these blues as a gradient with a little glitter on top and loved how the result looked a little bit like a snowy, winter sky, so I decided to do it again--only this time, I went with some actual snow in a little holiday/seasonal scene...and I think I inadvertently wound up with a mash-up of two manicures I've enjoyed lately, by Kayla Shevonne and Raggio di Luna Nails...which I don't mind at all because I thought the originals were totally adorable! The night sky is a triple gradient of Sally Hansen CSM Jungle Gem, Sally Hansen CSM Please Sea Me, and Nicole by OPI Alex By The Books, and then I swooped on some snowy tips in Pure Ice Superstar. The trees and falling snow are acrylic paint, a dotting tool, and my tiniest of tiny brushes. I can't help but laugh at myself a little because I got so into my little trees that I used two greens to get them looking all highlighted and stuff...and then went and half-covered them up with snow. I'd also like to congratulate myself on combining minty teal, teal-skewing navy, and true white polish with my own pasty-pink skin tone, a combination that rendered my camera's white balance utterly and completely unable to cope. Details aside, though, I was really happy with how these turned out. I just hope I can manage another Christmas design or two in the next few days because I honestly did not realize how close it's getting... Panic mode, engage! 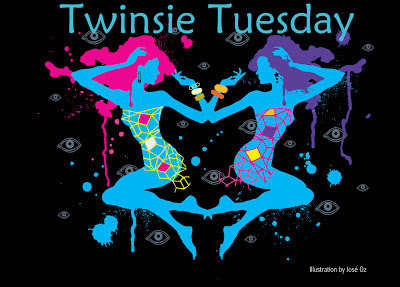 Hopefully my fellow Twinsies are having a much more relaxed time, enjoying their pretty, blue somethings! 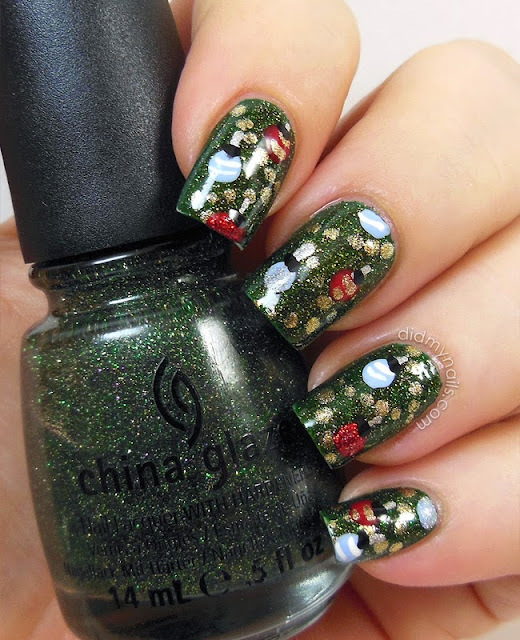 Like Angel Wings and Winter Holly, China Glaze Glistening Snow is another very finely milled glitter from the 2012 Holiday Joy Collection. It's a lovely, soft silver that's been dusted with holographic particles to make it glint and gleam (and presumably, glisten) like twinkling Christmas lights reflected in the snow. 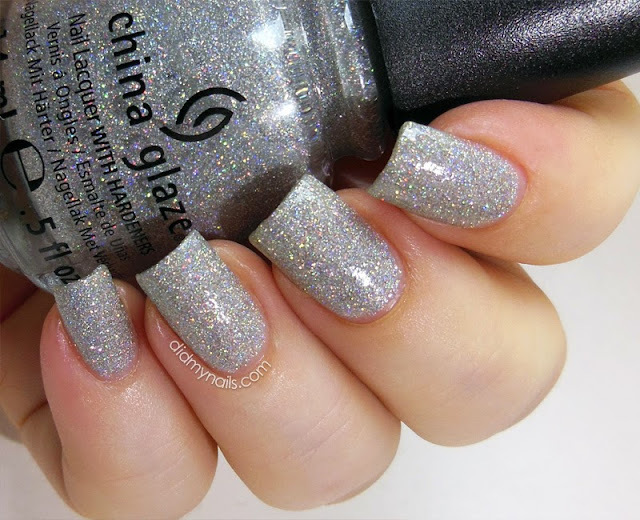 China Glaze is so good at these fine, full coverage glitters! They are extremely top-coat thirsty (this is Gelous + SV, and it'll need at least a third coat to be glassy-smooth), but the soft, sparkling payoff is so beautiful! 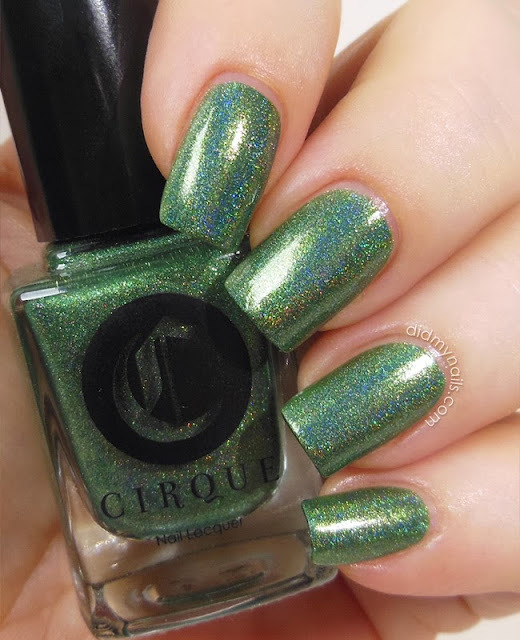 You can also choose to wear it without top coat; it dries to a matte finish that's surprisingly smooth to the touch and still gives off those little holo flashes. I like it best top coated, though, all sparkling and twinkling--and yes, glistening--in the light. I really could go for about eleventy-jillion more of these glitters, in so many colours! Could you get on that, China Glaze? Pretty please, for me? Last year an enormous Christmas pudding in The Nutcracker ballet inspired my Christmas Day post...but with the clock ticking at just half an hour before we had to hit the road, I was scrambling so hard to schedule the post that I didn't even get to top coat, much less spend a little time actually enjoying those nails. One of the main things about seasons, though, is the way they tend to come around again, and this year I decided that I would actually get to wear my Christmas pudding nails long enough to let them dry and stuff. So fancy! 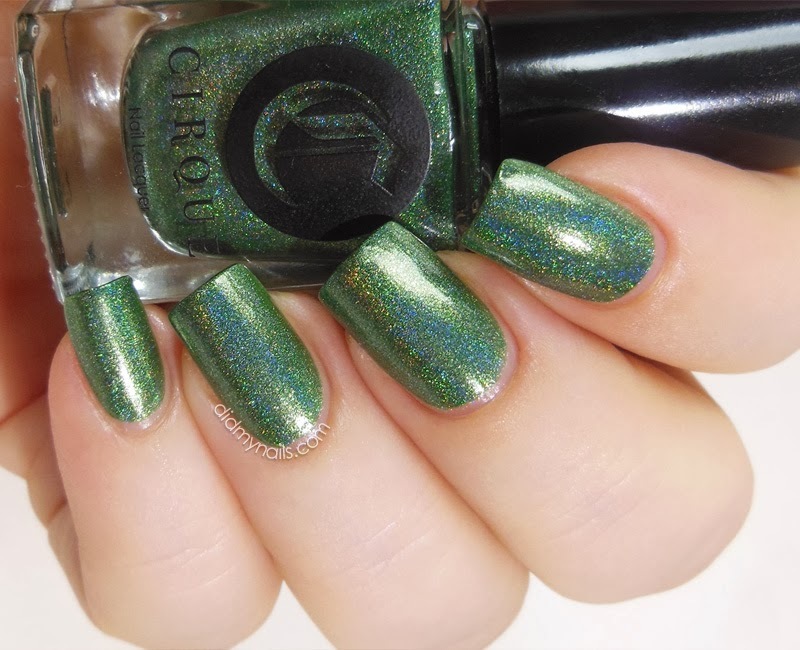 The minute I first saw swatches of Lac Attack Holidays In Hogsmeade, I knew this polish would someday be mine. Honestly, it's Christmas, Harry Potter, and nail polish (with glitter! ), all in one little bottle--I never stood a chance. Lac Attack Holidays In Hogsmeade is a mix of different sizes of satin/matte glitter in red, green, and white, suspended in a clear base, and I'm glad to say I was able to pick up a nice selection of the glitters without having to fish unduly for the large, white pieces. This is one coat, longbrushed and dabbed in, over Julie G Gelato in Venice, a beautifully soft mint green. I picked up my bottle of Lac Attack Holidays In Hogsmeade from Dazzled, pretty much literally (They ship all over, but if you're in HK you can also arrange to collect your order in person) and could not wait to wear it--big thanks to the lady in line at the post office yesterday for the compliments! I'm sure I'll be wearing this one again before the season is out and probably beyond as well... Cris at Let them have Polish! actually wore this one over a soft teal base, and the combination was absolutely adorable. Lac Attack // Dazzled // Harlow & Co. This is one generous coat of Glitter All the Way, applied normally, over Milani Chocolate Sprinkles -- I absolutely loved the combination! It made me think of warm Christmas cookies. Thanks to the purple mixed in with the red, green, and gold, I don't think this polish should have to wait for the holidays again to get another turn. It's adorably Christmas but not exclusively, not too on-the-nose to work during the rest of the year. And it'll definitely look fantastic come next Mardi Gras! China Glaze Glitter All the Way is from the 2012 Holiday Joy Collection. Our last four TT themes of the year are the wedding "somethings," as in old, new, borrowed, and blue. This week's is Something Borrowed, but rather than do something totally sensible like borrow a polish from a friend...or use Essie Borrowed and Blue, because how perfect, right?...I decided to let Google be the boss of me. Typing "Something Borrowed" into Google Images returned about eight jillion copies of this poster (only a slight exaggeration). I don't know the movie, probably because I live overseas, but I took it as my cue to pull out the striping tape and try some colour blocking. 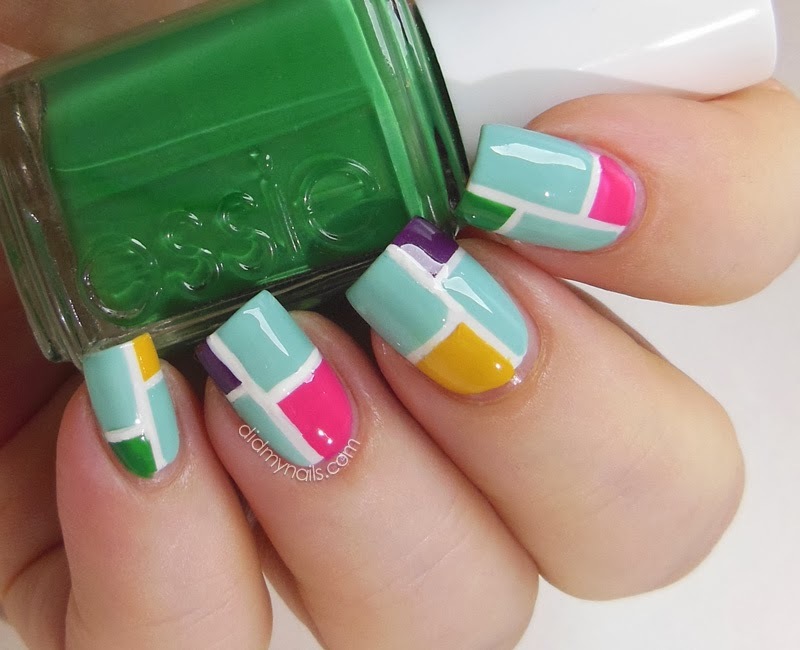 It was a pretty thin line between movie poster and nail art too--this colour-blocked design was practically made for striping tape, and I've been meaning to try this look for ages. Some people manage to get such crisp and perfect lines with their striping tape, and I still need more practice before I'm close to that. Thankfully, nobody was looking at my nails today from three inches away; at arm's length, any little wobbles and glitches were practically invisible! Over Bandi Snow White, I taped out the boxes and then filled in half with Skinfood BL003 (Green Bean Milk). For the others I used Skinfood PK002 (pink), Essie Pretty Edgy (green), OPI Dutch 'Ya Just Love OPI? (great purple, but that punctuation makes me gnash my teeth so hard... Dear OPI, if you're going to insist on using apostrophes, please, please learn where they do and do not go), and Bourjois Jaune trendy (deep yellow). 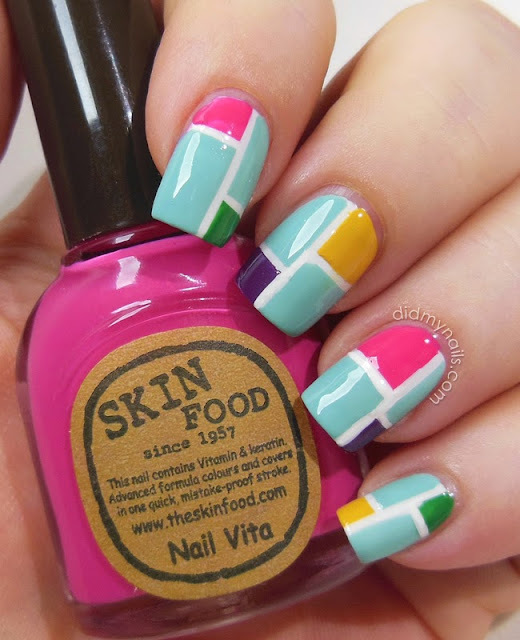 This is definitely a look I need to try out again--it would look so great with so many colour combinations, and with luck, a little more practice should see those stripes looking nice and crisp. I hope my fellow Twinsies had as much fun this week with their Something Borrowed! I reallyreally hope y'all aren't sick to death of roses because I'm still having so much fun playing with them! I've done similar flowers before--a few times, at very least--but this time I wanted to see if I couldn't try to make them a little softer and more swirly. Basically, a little more romantic. Once again, my base of choice was OPI My Vampire Is Buff, and it continues to be one of my favourite bases EVAR. Also once again, the flowers and greenery are acrylic paints. Sometimes I love a bolder, more modern look, but I tried to go softer with these. My strokes were a little wispier than usual, and I think I managed to get a little more of that "romantic" angle I was going for...at least, it seemed to work with a few of them, and considering I still can't draw a circle or a straight line to save my life, I continue to be delighted any time I manage to paint a thing that actually looks like a thing. 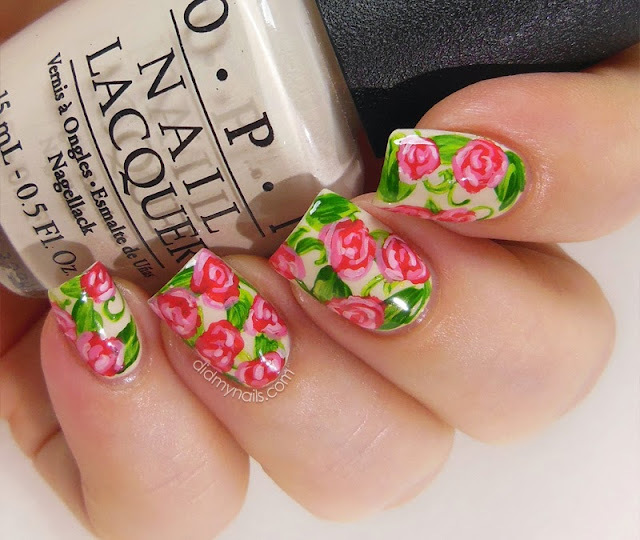 So yes, more roses! 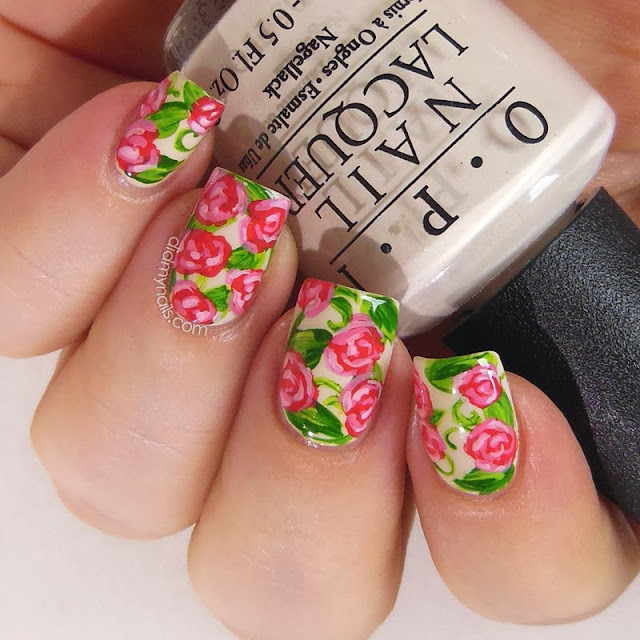 More flower nail art! Vampire Buff again! Apparently this compulsion isn't quite ready to let me go. Like CrowsToes and a-England, Shimmer Polish is one of those brands I find it both super-easy and super-hard to write reviews for because they are consistently fabulous. I'm running out of ways to say, "Awesome formula, great application, and the colours are just so pretty!" Case in point, today's glitter, Shimmer Polish Jennifer. Jennifer is a gorgeous glitter mix of pink lilac and aquamarine blue, in hexes and little tiny squares, with splashes of gold and bronze. As you can see on its page at Shimmer Polish, this is a combination that looks fantastic over a range of bases...in fact, for my own swatches, I couldn't decide between the complimentary dusty lavender base or a more striking contrast of black. So I didn't. Please join me for a few more pics, after the page break! Many of us have that area, a little spot on top of the Helmer or wherever, where we keep our special polishes, those jewels of our collections that we just can't seem to hide away in a drawer. 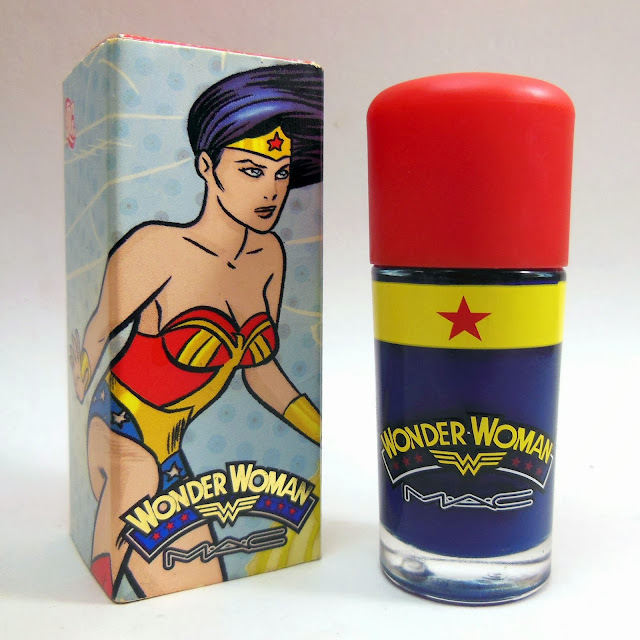 Pride of place on my Helmer goes to MAC Wonder Woman Spirit of Truth. 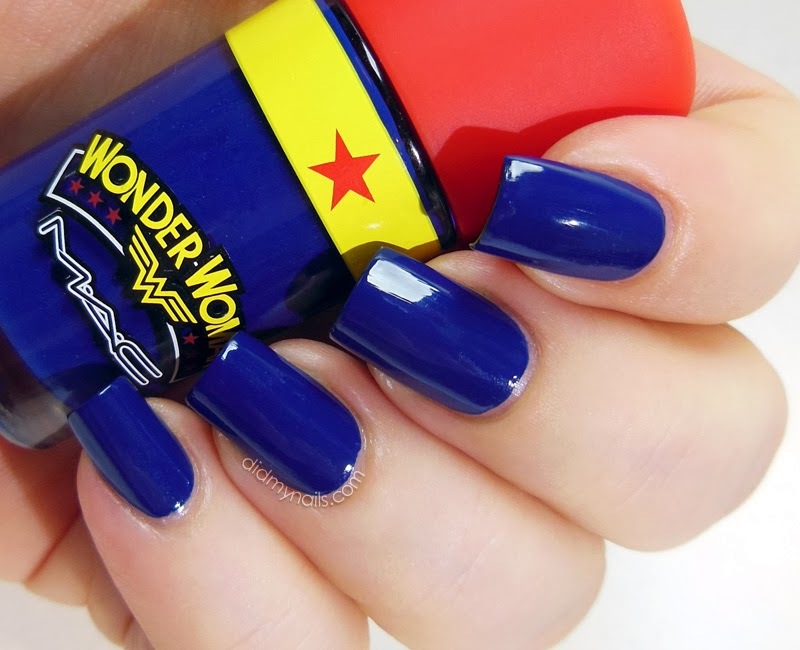 Part of the spring 2011 MAC Wonder Woman collection, Spirit of Truth is a bright, royal-navy, perfectly Wonder Woman blue. It's luxuriously pigmented and very easy to control, and I heart it with all the hearts that have ever hearted a thing. Wonder Woman has always been my girl. I watched the show when I was little and cried when I outgrew the Underoos. I used to mash tin foil bracelets onto my wrists and spin and spin until I transformed into an Amazon princess (or until I fell down, which is probably why I was encouraged to go "transform" in the backyard). 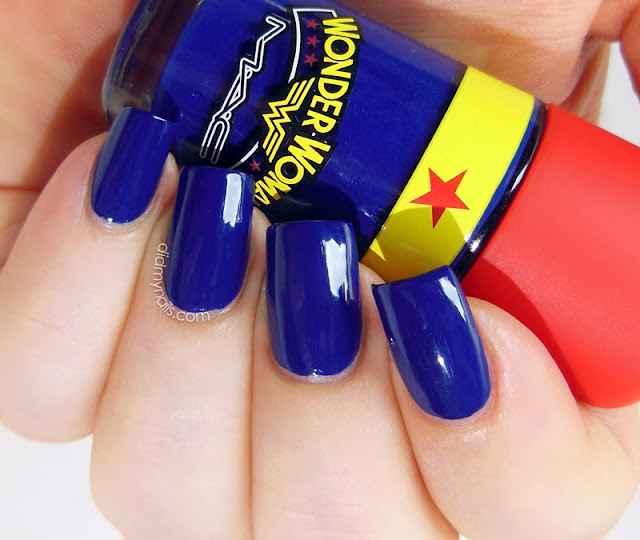 So when I saw the press releases for MAC's Wonder Woman collection a couple of years ago, I hit full-on geekgasm and made a solemn vow to myself that when I went to the US that summer I would be coming home with some =W= nail polish of my very own. Unfortunately, given the extreme fabulosity of this collection--I mean, look at that packaging, I could just...GAH!--it was getting pretty hard to find these limited editions by the time I made it over to the US, so I wasn't able to snag Obey Me, the likewise bold and beautiful, red, sister polish to Spirit of Truth. Why, oh WHY does simply ordering online never seem to occur to me?! Let's be honest. I'm such an enormous =W= fan that even if the polish had been rubbish, I would still love it because Wonder Woman. Thankfully, in addition to loving the branding to bits, I'm also thrilled with the polish itself. I don't usually go for such straight-up blues that don't have any dusty or teal-ish lean, but MAC Spirit of Truth is absolutely amazing. Oh, hey, amazing! Because Wonder Woman! The Amazing Amazon. Sorry. This polish makes me so happy, I can't even object to inadvertent puns. This week the Twinsies are bossing each other around again, and the theme is holiday gifts...gift being a nice name for some new marching orders to challenge the recipient. My assignment came from the lovely Heather, who challenged me up good and hard with "water marble Christmas tree." I haven't done a water marble in ages, and I definitely hadn't tried to make specific shapes before, so this was most definitely a challenge! Such a challenge that my index finger went way off the rails, necessitating a back-up plan...but I actually think the candy cane nail art there (OPI Big Apple Red with Orly Crisp White nail art striper) makes for a cute contrast, so I'm hereby declaring it a totally on purpose accent nail. The water marble Christmas trees are Essie Pretty Edgy and Essie Going Incognto, with Zoya Ziv dots (thanks to Colores de Carol for that inspiration!) and some gold, glitter stars that I liberated from another polish. Hopefully this is at least close to what you had in mind, Heather! I'm looking forward to seeing everybody's gifts...and to see how Kelly's "seasonal animal print" turned out!